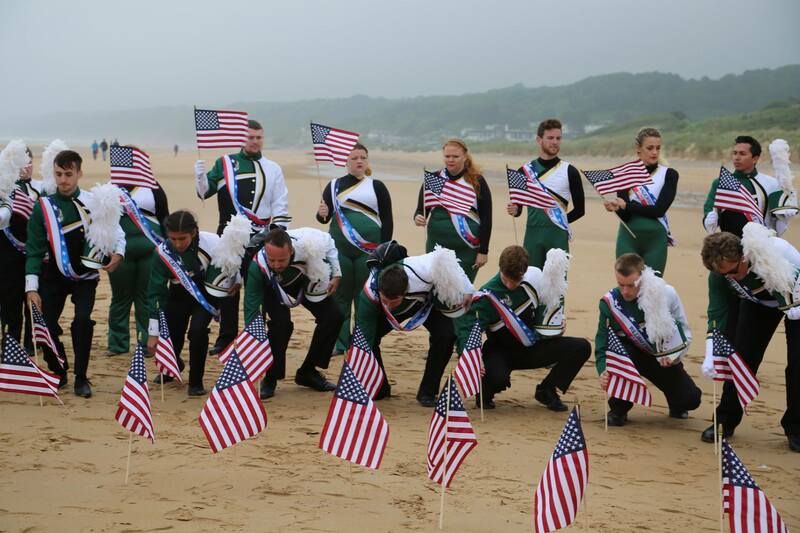 From planting American flags at Omaha Beach in Normandy, France, to performing ‘Amazing Grace’ at the Brittany American Cemetery and Memorial, members of the Pride of Niner Nation represented UNC Charlotte and the United States at the 74th commemoration of D-Day. Over 40 of the student musicians are majors or double-majors in the College of Liberal Arts & Sciences. A film called “Origins of Opportunity” is available to chronicle the Pride of Niner Nation Marching Band’s extraordinary opportunity that has enabled present-day students to explore places where history was made. The film includes coverage of the band’s performances and the reactions and perspectives of students as they experience the sights and sounds of the historic Normandy coast. Historical perspectives can be found in the film and in this section of the Normandy website. Segments draw upon the expertise of Professor Mark Wilson, a faculty member in the Department of History. The site also features Professor Emerita Susan Cernyak-Spatz of the Department of Languages and Culture Studies, who brought Holocaust studies to the forefront at UNC Charlotte. Now, the Center for Holocaust, Genocide and Human Rights Studies is housed in the Department of Global Studies in the College of Liberal Arts & Sciences at UNC Charlotte. Also in the historical section of the website are reminiscences of UNC Charlotte alumna Hattie Leeper, known to her audience as “Chatty Hatty.” Leeper was a pioneering voice in Charlotte radio, as North Carolina’s first African-American woman on the air. Leeper, who earned her bachelor’s degree in criminal justice and her master’s degree in educational administration from UNC Charlotte, recalls the special role radio played for veterans as they returned from war. Other sections of the website capture personal stories of UNC Charlotte faculty and staff, as they have related their family members’ roles in World War II. The group that went on the trip was the largest group of UNC Charlotte students ever to travel together abroad. In another first, they were the first university band from North Carolina to represent the United States at an annual commemoration of the D-Day invasion.